Not content to harass domestic traffic absent individualized suspicion of wrongdoing at roadblocks inside the country, Border Patrol agents are now storming private homes to seize video evidence of their own wrongdoing. 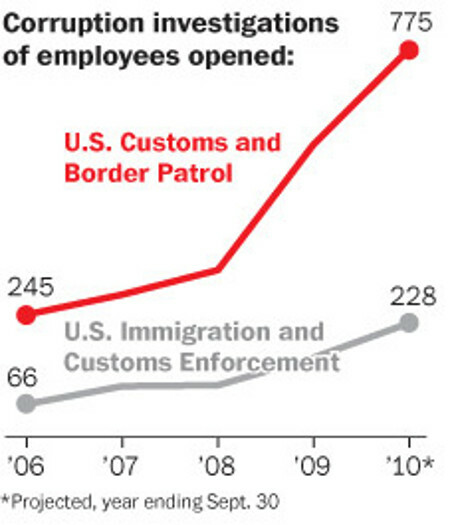 Over the past week or so, several articles regarding skyrocketing corruption within Customs and Border Protection ranks have been published in the Washington Post and the Los Angeles Times. CBP corruption (formerly U.S. Border Patrol and U.S. Customs) has been an ongoing trend I’ve been watching for the better part of the last decade so it’s good to see main stream media outlets starting to cover this issue in greater depth as well. Two recent articles appearing in the New York Times highlight the burgeoning American police state compliments of the Department of Homeland Security. It seems that the Border Patrol has as much difficulty finding the Northern border as its Southern counterpart, choosing instead to harass domestic Amtrak train passengers traveling between Chicago and New York City with nary a stop near anything resembling an international border. Update: 17DEC2010 - Looks like the video has been reposted. 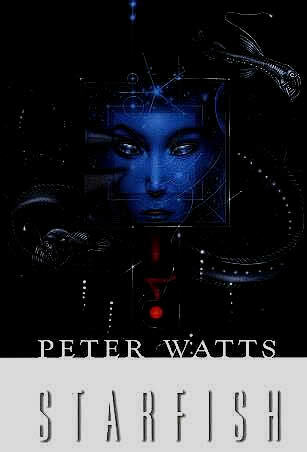 I've updated the embedded link accordingly. The checkpoint depicted in the video above is the interim checkpoint located near kilometer post 45 on I-19 in Southern Arizona and championed by Congressional Representative Gabrielle Giffords in Arizona’s 8th District. Like so many other Border Patrol checkpoint encounters, the video above documents harassment of the traveling public by agents who take advantage of their limited authority in an attempt to intimidate individuals into waiving their fundamental rights. In yet another example of illegal Homeland Security enforcement activity inside the country, 18 year old Iris Cooper is one of the latest victims of Border Patrol aggression against the traveling public. Last month, Mz. Cooper was on her way to class at the Pima Medical Institute in Tucson, AZ when she realized she had left her school books at home. 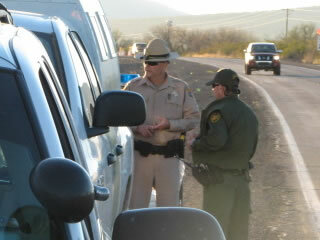 Northbound on I-19 in Southern Arizona, she turned around to retrieve them only to be stopped, seized, detained and searched by Border Patrol agents shortly after conducting a perfectly legal about-face. 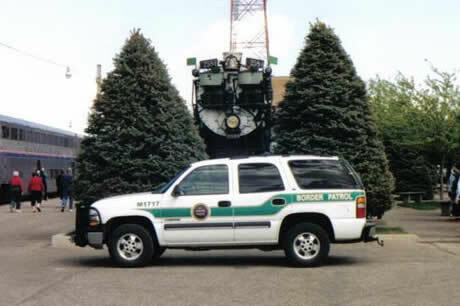 In addition to seizing and searching her, the federal agents added insult to injury by handcuffing her and forcing her to wait thirty minutes for the arrival of a K-9 unit that proceeded to search her vehicle upon its arrival absent consent. 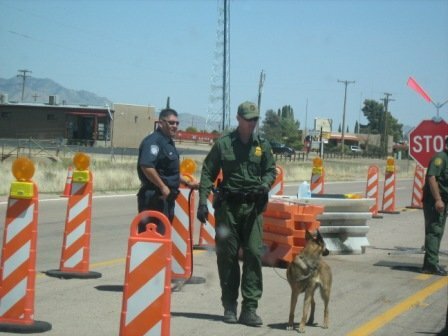 On September 11, 2009 in a significant departure from standard operating procedures, Customs and Border Protection officers normally assigned to Ports of Entry are observed working the primary stop location of an internal checkpoint over 40 miles North of the border along a highway never intersecting the border at any point. 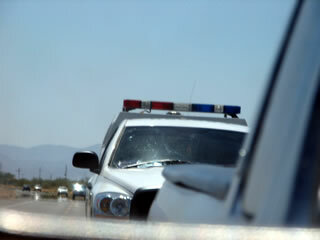 This is the continuation of a shift in Homeland Security tactics first observed on August 21, 2009. Whether or not this is a temporary experiment in cross-training personnel from different units within the agency or a permanent shift in DHS tactics remains to be seen. On July 16, 2009, KGNS-TV News 8 in Southern, Texas ran a story about a local property owner who has been experiencing a fair amount of harassment from Border Patrol agents in the Laredo Sector.